When I went out for lunch today, I saw this basket cart. Love baskets, and there are some beautiful ones here in Laos, especially those made from rattan. For other pictures from around the world, check out That's My World! WOW! That is a LOT of baskets!! Very cool to see that. 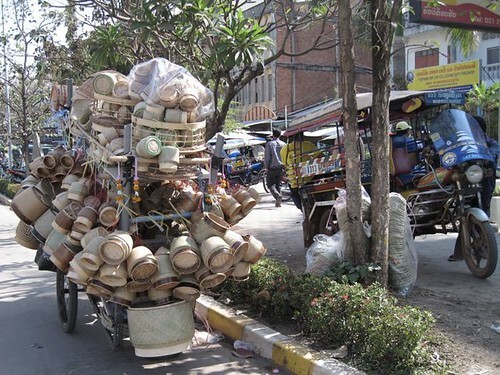 Amazing stacking on that bicycle! Sure is plenty to choose from here. I doubt if the vendor could carry many more. Thanks for sharing your beautiful world. I love the photo. oh, i've seen some of those here in the Phils but it's been awhile since the last time I saw one. The scenes you captured here could well be in our neighborhood. Very interesting, Chanpeng. It's amazing how many baskets they managed to attach to that cart!